While this sentiment seemed hopeful at the time, the CCC initiative has positively impacted Coastal Carolina’s first-year composition program by providing a programmatic framework for teaching and assessing academic literacy skills central to students’ development and success. This is not to say that the initiative was implemented flawlessly; as the program evolved both technically and conceptually, faculty and student populations had to adjust to a new format for teaching and learning in first-year composition courses. As we reflect on this initiative two years later, we would like to share our insights on designing and building an entirely organic digital badge program in the hopes that others might embrace a similar model that recognizes and rewards student achievement. Two courses, English 101: Composition and English 102: Composition and Critical Reading, make up the first-year composition program, which typically is completed the first and second semester of enrollment. Although Coastal Carolina University is considered a mid-size institution (the student body population is approximately 10,000), it faces many of the same challenges as larger universities. For one, numerous sections of first-year composition courses are taught by a diverse number of tenured, tenure-track, lecturer and adjunct faculty; during the current academic year (Fall 2015 - Spring 2016), 4,364 students enrolled in 237 sections of English 101 and English 102 courses were taught by 79 different faculty members of varying ranks. The Coastal Composition Commons translates the student learning outcomes for each course into individual badges: eight in English 101 and six in English 102. In doing so, the badges provide a baseline instructional consistency — but not a standardization — as they ensure learning outcomes are addressed across all sections. The digital badge program is tied directly to academic credit, which increased the traditionally three-credit-hour composition courses by one credit hour. Badges account for 18 to 24 percent of the final course grade. To earn a badge, students first log in to the Coastal Composition Commons site and navigate to the badge specified by their instructor. The ensuing page delivers instructional text (developed collaboratively by members of the English department) and an embedded assessment. 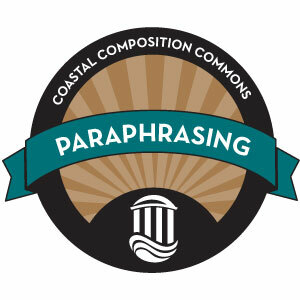 For instance, the “Paraphrasing” badge explains what paraphrasing is and why it is used; models how to paraphrase a text; and presents a three-part assignment for students to compose and submit. This submission is reviewed the student’s instructor and is either approved or denied. If approved, the badge is automatically e-mailed to the student and displayed in his or her individual badge profile. If denied, the student is notified via an automated e-mail that contains the instructor’s comments on how to improve the submission and whether or not a second attempt to earn the badge is permitted. The “Paraphrasing” badge certifies that students can paraphrase other sources in their writing in ways that make it clear that they understand other writers’ ideas, when they are presenting these ideas, and how these ideas inform and extend their own points. Since the inception of the badge program in the Fall of 2014, roughly 53,000 badges have been approved. The most commonly assigned badge is “Shaping a Thesis” (5,775 recipients), which certifies that students can articulate a thesis statement. The least awarded — and presumably the most difficult — badge to earn is “Synthesizing II” (1,867 recipients), which is assigned in English 102 and asks students to weave between summaries and paraphrases from multiple sources as they develop their stance on a subject. In the current academic year, there have been more than 193,000 logins by students and faculty, totaling more than 3.8 million page views. The technological infrastructure consists of a custom designed WordPress site using the BadgeOS plugin and Credly achievement system. Aside from the university IT staff performing routine maintenance, the site has remained cost-free, and no major glitches or setbacks have occurred, despite the heavy traffic. Although student perceptions of digital badges were mixed at first, the majority of students have reported a positive experience with the CCC program as a whole. An early survey of faculty members indicated that 35 percent of their students were “dissatisfied” with digital badges. However, a more recent survey conducted in November 2015 showed that only 7 percent of students continue to feel this way. Although the program has evolved incrementally over this time period, we suspect that much of the initial dissatisfaction stemmed from a faculty adjustment period. As the badges themselves become more refined and faculty continue to find ways to smoothly integrate badge content into their courses, we predict that student satisfaction will continue to increase. “Now, I am trying to apply what I learned from the badges in my other assignments in college.” - Michelle S.
“The badges helped me enhance my writing.” - Thomas C.
“The badges gave me a broader view of what I thought was basic.” - Delmar W.
Data from internal institutional assessment also supports the effectiveness of the digital badge program. Three random essays are collected from every section of English 101 and 102 each semester and these are assessed by a team of instructors each summer. The assessment readers use the program’s student learning outcomes as they read and rank each essay as exceeding target, at target or below target. The 2014-2015 assessment showed a significant shift from “target” to “exceeds target” in many of the outcomes addressed via badges, such as establishing a main point, integrating quotations and synthesizing sources. The introduction of badges into the first-year composition program radically altered the way courses are taught and the way students are evaluated at Coastal Carolina University. Faculty found it necessary to redesign their syllabi and recalculate their course grading percentages to incorporate the digital badges. Earning badges promotes high-stakes student writing, and the assessment of this writing is time consuming. In essence, the digital badges require students to produce at least six to eight more artifacts of writing in English 101 and English 102. And although each badge specifically targets a course learning outcome that should be evaluated anyway, and faculty compensation reflects the addition of a fourth credit hour, the most prevalent criticism of the badge initiative was (and continues to be) the additional time spent reading and responding to badge submissions. Importantly, each of the 14 badges has been crafted, critiqued and revised repeatedly by members of our own English department. Everyone from adjunct to tenured faculty is invited to claim some ownership over the badges by composing and revising their content. Even graduate students and research assistants have been tasked with reviewing the site’s content and usability. Two years after its inaugural semester, the site remains fluid; students are encouraged to submit suggestions for improvement, and regular composition and professional development workshops offer an outlet for faculty discussions about ways to manage the digital badge program in their classes. Over the summer of 2015, 13 instructors of composition revised the badges in in light of a discussion that took place during a workshop that May. We can’t help but connect this high level of faculty involvement with the substantial increase in instructor satisfaction with the Coastal Composition Commons. Since its launch, there have been many improvements to the CCC site. Support pages for students and faculty have been created, which include video tutorials, FAQs, recommended pedagogical activities and resource documents. A contact page gives students and faculty a help option, too. For each of the badge assessment activities, we provide suggested texts but also have redesigned many of the assignments to allow for instructor flexibility in selecting unique texts. Along with the ongoing professional development opportunities for faculty, the site is being continuously revised for clarity and relevancy. Last, a mobile-friendly design has made the site more accessible for mobile devices. Importantly, the site continues to evolve with its users. The digital badge initiative at Coastal Carolina University still faces some big questions. At the forefront of our minds are philosophical issues such as how to translate the value of these badges into a real-world currency for our students and how earning badges can positively impact learners with low expectations of these courses. Other technological issues also persist, such as the permanency of the badges and online storage space. However, one thing is certain: This initiative supports collaboration and pedagogical innovation throughout our first-year composition program, and it makes visible our commitment to student learning and success in our composition courses. In that sense, the Coastal Composition Commons has given us more than just neat badges for our first-year writers; it has instilled a sense of pride in our program, and that has deep and lasting value.